I actually recommend the whole episode, it was one of my favorites! Anyway, so the question was: is the text on this VHS box written in Japanese or Chinese or something else? The answer is that it’s Japanese, but I can understand why they (and others) wouldn’t know how to tell the difference. So here are two super-quick ways for the average Joe to tell if text is Japanese or Chinese. If you see this の (pronounced “no”) in a bunch of text, 99.9% of the time it’s going to be Japanese. So look for this character! For example, in the VHS box image above, you can see a couple of these の characters, indicating that the text is Japanese. If you can’t find a の, then the next trick is to look for “simple and curvy” writing mixed in with the “Chinese-looking” writing. The の is a curvy and simple character, for example, but Japanese uses a lot of others too, like: う　し　ち　つ　ひ　め　ん and more. So If you see any curvy and simple writing like this, it’s a really good sign that it’s Japanese text. It’s not as easy as the の test, but it’s not too hard once you know what to look for in general. The confusion between Chinese and Japanese is understandable – it partially stems from the fact that Japanese imported the Chinese writing system a really, really long time ago. But Japan went on to create a few more writing systems of its own, so modern Japanese mixes several types of writing. The tricks above are ways to spot those other writing systems without actually knowing them. Keep in mind that these are just basic tests, though. If there are no のs and there are no simple, curvy characters, then it could still be either Chinese or Japanese – you’ll just need to know more about the languages to differentiate them at that point. Could you figure them all out? There are a lot of straight, complex-looking characters in there… but you can also see のs in there, plus lots of simple curvy characters mixed in with it all, which indicates it’s Japanese. In summary, this is all meant to be a super-simple litmus test – I’ve skipped over lots of technicalities (including the multiple types of Chinese writing), avoided explaining exceptions (long kanji compounds, the Chinese-adopted の, etc. ), and oversimplified everything (not even mentioning Korean, etc.). If you can already tell the difference between the languages, that’s cool; these tips are more for people who have no knowledge of any of the languages, like the Red Letter Media guys. Still, I’m sure there are much better tips than what I’ve suggested here, so if you have any suggestions of your own please share them in the comments! If you liked this article and know someone else who'd like it, let them know about it. Thanks for the support! I always look for familiar symbols, not just the “no” symbol. Most likely when I see complex kanji-looking symbols and little to no relatively simple symbols, I automatically assume it’s Chinese. Take for example the Ocarina of Time thing (I believe it’s a manga cover? Correct me if I’m wrong); I can immediately tell the left is Chinese not just from the last of no but also because there aren’t any hira/katakana, it’s all the complex stuff. Also look at the one above the OoT, the right image is covered in complex stuff with little to no simple. I hope that made sense, I know pretty much nothing about Chinese so I don’t know what the correct term for those symbols are. I think maybe Hanji? In Mandarin, the native name for Chinese characters is “hànzì”, where the grave marks, along with the acute (´), caron (ˇ), and macron (¯) indicate how the pitch changes as one pronounces the word. That means, when you reach the “à”, start with high pitch and go to low pitch before reaching the “n”, then for the “ì” at the end, do the same thing. If I’m understanding you correctly, you would pronounce it like “hand see”, right? Or am I totally butchering it? The thing with Chinese is that it’s a tonal language, the same phonetics said in different pitches will result in different words or non-words. For example, “ma” when said with a certain pitch will mean “mom”, when said with a certain other pitch it will mean “horse”. Without going into tones, the “han” part would be pronounced with sort of a “hah-n”, while the “zi” is sort of like a “d” and an “s” smashed together with a short “i” noise. It’s a little hard to explain for me, but your attempt is understandable. The romanization systems don’t sync up very well with the way we pronounce things in English. The Japanese word kanji is actually the Chinese word hanzi pronounced in Japanese. Yeah, I didn’t want to bring that up in the article itself to cause extra confusion, but I think for the average Westerner the の tip should serve them well. The circle test works for me too! I also think of their characters as being roughly equal in complexity, that helps. Throwing a few の’s in here and there in Chinese is more or less equivalent to throwing a few French «le»’s in in English. Should be fairly easy to pick out. I know nothing about Japanese or Chinese but I’m usually able to tell the difference because Chinese characters look more wide while Japanese ones look more slender to me and if it’s Korean, I look for a ton of little “o” like symbols. There’s probably many examples where I’m wrong but I seem to guess most of the time with my little system. My method is basically this, except for korean i usually look for characters that look kinda like a combination between kana and kanji, with a whole bunch of squares and other shapes that don’t mix (as in, the shapes not really having other shapes in them very often). Is there something intrinsically special about の? I play quite a few imported Japanese games, and sometimes when my mum is casually observing over my shoulder, she’ll say “Oh, I saw a ‘no’ in there!”. She doesn’t know a single bit of Japanese but for whatever reason this symbol stood out to her as something she could recognise time and time again. It has a bunch of different roles in the Japanese language, the biggest one is that it indicates possession or relation to something else, kind of like our apostrophe-s in English. There’s way more to it than that, but basically it gets used a lot in Japanese. …With the exception of “Sukaiwodo Sodo” and “Towairaito Purinsesu”. ….. why do these two games use an English title in Japanese, anyway? I’m not sure, I guess it was just the creators’ preference. Because those titles are in katakana; “スカイウォードソード” is a phonetic spelling of “Skyward Sword”. Ditto ” トワイライトプリンセス” for Twilight Princess. I’ve actually wondered for a while if this might not be part of why recent Zeldas haven’t done so hot; they’re presented as being surprisingly “western”, straight down to their titles no longer being “true” Japanese, but rather English loan words. It’s especially funny because you could totally represent either title in proper Japanese; “黄昏の姫” is literally Twilight Princess, for example. The TLDR is that those two are purely loan words, as opposed to the proper Japanese or mix of both that other titles are. Yeah, it’s very hard to tell why those two abandoned the old structure. 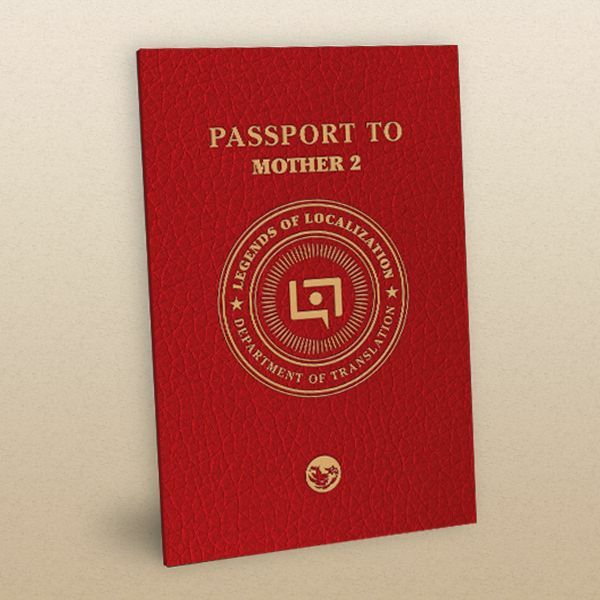 It probably does come down to creator’s preference, or possibly a desire to more tightly unify the names across regions (as some of the games have *wildly* different titles between regions; the most famous is Zelda 3, wherein “神々のトライフォース” and “A Link to the Past” have *not a thing* to do with one another). Which does still tie in to my ruminations on perception in my previous post. If you know any Spanish, の serves essentially the same purpose as the Spanish “de”. If you’re reading this site you should attempt to learn Japanese kana! 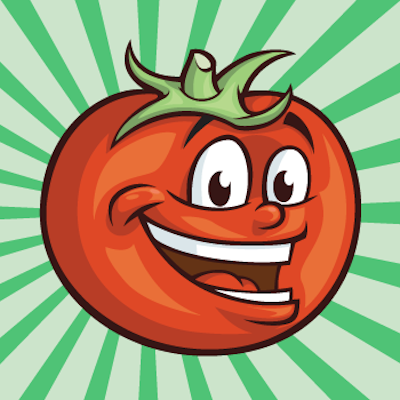 It’s very easy and fun, I used Memrise. Not sure if legitimate comment. Sorry if it is, but it looks… Kinda spammy to me. In case it isn’t though, may as well reply. I just wanted to say that, even if we were to learn Kana, it wouldn’t help us that don’t know the language much. Knowing a potion in Pokemon is called a Supurē Shiki No (yay Wikipedia’s Kana articles, Google translate, and screenshots of JP FireRed) or some such doesn’t really help us a lot if we don’t know the language anyway. But learning kana is the first step toward learning the language. I mean, sure, you can learn with romaji, but it’s not gonna help you much if you actually want to read things. Besides that, if you can recognize what a word says, even if you don’t know what the word means, it can help you stumble through things (like, say, a video game). And you might even learn by context sometimes! Never thought of that. Learning by context… Like how everyone learns their first language. …Huh, good point. Never thought of it like that. Thanks. 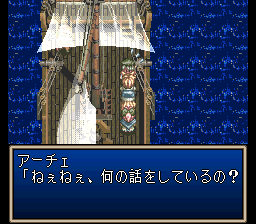 There’s also a surprising amount of stuff in Japanese games that’s just English words transcribed into kana. 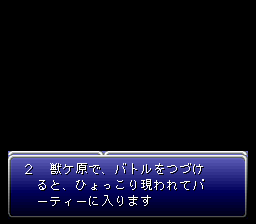 Once I knew ポイントバトル, デスマチバトル, Ｊシンボルバトル, サポート, and リングアウト, Jump Ultimate Stars sorta translated itself for me. That video was quite… the experience. I’m not even sure I want to see the other two. Also, L L R L R R L? I cheated on Set 7. I saw the .jp internet designation. Was gonna say, Mato, a couple of these would be a little easy even without much knowledge of either language just thanks to some contextual clues. :V It’s all good, though. I just had to say “Ha!” to your line about the future refusing to change. That game is definitely in my top 5 all-time favourite. Also, I just realized that you include alt-text for your images. Mind blown! Some are quite funny. And now I’m going through all the archives, reading every single alt-text for every single pic you’ve included. Reminds me of the book Digital Fortress. An expert on Chinese is tasked to translate a text – character by character. As in, he’s given each character in isolation, in random order, without knowing any characters it’s next to. As if this weren’t stupid enough, it takes them a while to figure out that the text is actually Japanese (which the book calls Kanji), not Chinese (which the book calls Mandarin). By the way, the book was written by Dan Brown. Dan Brown has an amazing ability to write about things he knows next to nothing about in ways that sound sort of logical to people who know even less about the subject than him. All his other books are equally stupid. That’s part of the charm of his books. Kind of the same how Japanese devs/mangaka could come up with hilarious depictions of the Western world. Dan Brown just… Doesn’t do his research. AT ALL. And somehow he mixed up Spain and Mexico, too. Over the years I’ve become able to distinguish Japanese text from other Asian languages by sight (though I certainly can’t read any of it), and this article articulates pretty well the ways in which I (subconsciously) seem to recognize it. Well done! The best way I’ve been able to distinguish it, is that when I look at Japanese writing, it’s pretty easy to tell how the letters might have been formed, other than the Kanji, which are complicated. Chinese symbols look extremely complicated, more like hieroglyphics than letters. I’ve heard somewhere that Chinese letters represent entire words, so if that’s true, perhaps the necessity for them to be more complex is why. But in any case, if I look at the text and the majority of it looks like something I could recreate as a scribe, I know that it’s probably Japanese. …It also helps that I taught myself how to read katakana, so I guess maybe I’m full of crap, and I just identify the language by looking for katakana letters. But I’m PRETTY SURE I use the method in the first paragraph most often. Chinese characters for the most part represent syllables, with a little bit of context thrown in to know what exactly is being talked about because there are a fairly large number of homonyms. They’re actually composed of radicals sort of like words are composed of letters, but because they’ve been in use for thousands of years and pronunciation changes over time, the writing system has become increasingly more complex as well. Basically what happens is when pronunciation changes wildly enough, people either don’t know that a word is written a certain way, or because it looks like it should be pronounced differently than intended, or to stress that a word is to be pronounced as in spoken language rather than formal language, etc., they’ll change the way a word is written by borrowing another character as is, or as is plus a little bit of context making it more complex. It’s easy to tell for me. I know the difference. Another kind of tease-cheat in those screens is the use of katakana. Chinese subs of anything generally spell the word out in English letters if it’s a foreign name, like if someone is saying “Pierre!” or “Alison” aloud. I’ve seen it in the Gear Fighter Dendoh DVDs I own: I just tried out the Chinese subs setting one time to see what how they handle it and when one of the characters who lived abroad was speaking French phrases, interestingly they wrote it out in plain English letters (“Bonjour!” and “Au revoir!”), so it stood out among the lettering. Thanks for this, Mato. While I understand that it might not work all the time, it’s always been something I’ve been interested in. Even though I know no Japanese at all (Well, except for Marth’s lines from SSB), I can usually tell between Chinese and Japanese due to, well, exactly what you wrote. The simpler characters tip me off. And is it left, left, right, left, right, right, left? The answers are in the image names. Chinese ones end in -c, Japanese in -j. 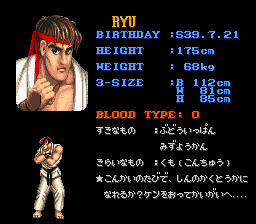 …Also, this may be a dumb question, but why are some Japanese things partially in English? I’m thinking of Ace Combat 3 in particular. The SYSTEM voice, the menus, the plane names, the mission objectives, and the mission names are all (mostly) in English. Ah, I see. It was mostly for efficiency at first, then it was for tradition. Thanks, that cleared everything up for me. Kind of like how they use the words “Critical” and “Hits” and similar terms in Tales and other JRPGs, right? That’s rather interesting in my opinion. 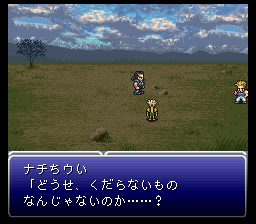 There’s also the fact that Western-made games usually tends to translate everything to japanese. Even the menus and other stuff that would be left untouched in japanese-made games. Say, a Metal Gear game might tell you to Press Start Button in English even in the Japanese version while a game like ZombiU woukd display this prompt in Japanese. I definitely would recommend that you write an article about this. 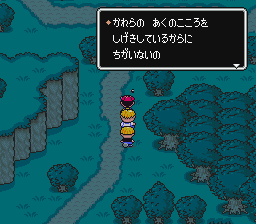 Basically the only Japanese in the game is the ‘character status’ (dead/injured/poisoned/etc), the descriptive text in the right window, or the system messages that tell you to do things like swapping disks. …Also, this is a tad random, but what do you think of the Final Fantasy Type-0 fan translation? You’re just kidding about 2chan though right? Do they know about this site? I was also going to ask this. Answer, s’il vous plait! Mato wrote about a site that’s the JP equivalent to legends of localization, explaining memes, cultural differences, even rticles from its English counterpart. Not unlikely that site -and by proxy, this one- would have a Japanese 2chan audience. Oh, it’s really simple. Most CH/JP/KR symbols fill a square. Korean-specific symbols consists of some little symbols (short lines, CIRCLES) that each take one third of that square. Japanese specific symbols are mainly two sets of alphabets with very simple patterns (often taking three or four strokes to finish). Another is katakana, has an equivalent to every single hiragana but is mainly used for foreign (aka English) words, and has a distinctive angular straight lines shape ライク　ヂス. As for hanzi aka kanji, they often FILL the square almost completely. Like, 90% of it. Koreans and Japanese, in addition to their own symbols, use hanzi mixed with those. Japanese and Koreans DO NOT like seeing lots of kanji in succession, it causes them headaches (breaking the gestalt or something) unless they’re learning Chinese. For some reason, all three of them like at times writing numbers with the chinese character for the digit instead of the appropriate arabic numeral. 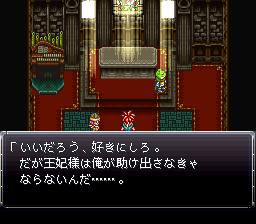 BTW, where was the eight game screenshot taken from (the one after Chrono Trigger)? 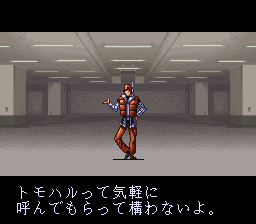 That one is Majin Tensei II, I believe. I knew exactly what you were talking about! We’ve been waiting for Shoji Tabuchi to pop up for several Wheel of the Worst episodes. Finally! WotW is my favorite net show (that, AVGN, and JonTron). This site is pretty rad, too! I can usually tell the two apart with the shapes of the letters? I don’t really know if I’m making sense, but it’s like how “cluttered” and the “shapes” they are? Anyways, this was a pretty cool read! Ha, I was hoping someone would see the screenshot and go OMG! You’re that person, hooray! I tried avoid saying “cluttered-looking” because Japanese can have really long kanji compounds and Chinese does have some uncluttered stuff, but overall that’s a good suggestion too! Hey I actually ran into the original video online. What’s getting popular among Chinese Internet-users is replacing the character 的 with の (both mean ‘of’ in general), actually. Yeah, I mention that briefly at the end of the article, but decided not to bring it up in order to keep things simple. SOS… This video from the future will completely break conventional wisdom! It is filled with action, suspense, romance and humour! Ah, looks like there’s a more accurate translation over here. I noticed that the screenshots of Tales of Phantasia are taken on a boat. In one of them, Arche says “What are you guys talking about?”. Shortly before that, Klarth says a really messed up line about who Cless should sleep with. He’s says something like “Mint is alright, but Arche f! @#$ like a tiger”! It’s pretty much a once in a game experience, but I couldn’t have been more shocked, especially with my mom in the room. Of all fan translations of unlocalized games I’ve played, I’ve never seen another. Considering it was in the DeJap fan translation, I’m so surprised they translated it like this! If reproducers of the game knew this line was in the game, would they market the game with a Teen rating? Probably, considering the very isolated scene this is in.